Job Jackets (also known as job ticket holders, shop ticket holders, job ticket envelopes, job wallets, and pocket envelopes) come in a variety of sizes to fit your exact needs. They are most commonly used in shop environments to hold job ticket information in a durable vinyl sleeve, keeping the information protected and organized. The ticket holders are generally made from vinyl because of the durability and the ability to read through them with little to no distortion. Ticket holders also protect the contents from damage from liquids, dirt, or oils from the wide variety of manufacturing environments. Now you can stand out with customized job jackets. We work with our customers to create just the right product for their specific needs. We have years of experience in creative design to tailor-make your custom product. Some of our customers include: retail and wholesale distributors, printers and publishers, medical care providers and hospitals, media distributors, real estate agencies, car dealerships and service shops, restaurants, animal care facilities, engineers, veterinarians, and many more! Below are some of the most popular personalized shop tick holder options available. Any of the options can be combined together to make a completely unique item. If you are looking for a different custom solution, please call us at (866)537-2244 or email info@buy101.com so we can discuss your individual needs and how we can meet them. • Magnets: Magnets are useful for placing vinyl sleeves on metal surfaces and are also very useful for closures on envelopes. We have a variety of styles for magnets including strips and buttons. Magnets are most commonly used on vinyl sleeves, vinyl envelopes, and job ticket holders. • Hook and Loop-Strip: Useful for adhering many types of vinyl products to surfaces with the ability to remove. Also useful for closures of large envelopes. • Colors: Black and white colors available. Good for all products. Opaque and Tinted Colors of virtually every color are available. Ask us for a list of colors. Colored product are handy for color coding and "flagging." • Metal Snaps: Metal snaps are another option for closing envelopes and sleeves. These are most commonly used on vinyl sleeves, vinyl envelopes, and job ticket holders. • Hot Stamp: Virtually any color is available. These may be applied as one solid color, or in multiple colors, depending on the product. This option allows an organization to put their logo on their product. Great for public exposure. • Emboss: This process offers an excellent subtle logo opportunity on certain products with header or a flap. • Copyguard Vinyl: This option is available when there is a need for preserving photos and fine print items. • Eyelet-Tin: Eyelets are often used to strengthen the hole area of hanging products. Stock colors include Brass, Dull Black and Nickel. Non Standard colors include Foliage Green and Coyote Tan. Special colors may also be available where quantities allow and lead time is sufficient. Two sizes are available - 1/4 inch is standard, while 1/8 inch may also be used. • Eyelet-Brass: Eyelets are often used to strengthen the hole area of hanging products. Stock colors include Brass, Dull Black and Nickel. Non Standard colors include Foliage Green and Coyote Tan. Special colors may also be available where quantities allow and lead time is sufficient. Two sizes are available - 1/4 inch is standard, while 1/8 inch may also be used. • Reinforced Holes: Reinforced holes are another option to provide additional strength to holes on the headers of many hanging products. • Hanging Hooks: Hanging hooks are useful for products made with a larger header, where slots cut into the product for insertion of the hanging hooks. These polypropylene hooks are packed in bulk and require user insertion. This hanging method is useful for hanging on interior car mirrors for permits and similar applications. • No Hole: This option is often used for products which will be bound. In this case there reinforced header or spine has no holes. • Elongated Hole: This option involves a small horizontal hole cut into the header of a product. Elongated holes are commonly used for retail or wall hangers. • Button Hole: Button holes are another hanging configuration which is also available for unique hanging opportunities. • Delta Hole: This is a triangle shaped, reinforced hole useful for multiple hanging requirements. Keyhole A keyhole is also called "sombrero hole" and commonly used for retail display hangers. • Business Card Option: A business card option involves an additional pocket which can be put on variety of products to allow the insertion of a business card (see product 35-0311 for a good example where a business card option can be added to the flap). • Extra Pockets: Most of the items we manufacture can have an additional pocket added to the front at extremely low additional cost, and is commonly added to Job Ticket holders. This option provides additional opportunities to display important information without having to use a separate hanging folder. 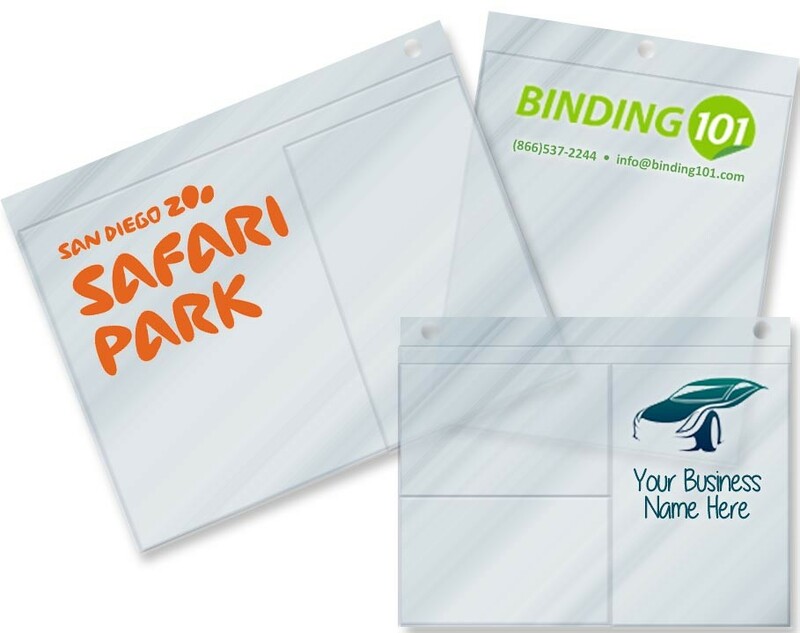 • Adhesive Backing: Most products are available with a permanent adhesive-backed configuration. These are great for displaying letters, posters, and other important information where constant touching soon disfigures the item. When you're ready for a quote, review these questions that our sales reps will ask you. These questions help our experienced team determine the best options for your specific application and requirements. You can then call us at (866)537-2244 or email info@buy101.com for a price quote. Note that the minimum order requirement starts at 250 pieces, but may vary depending on the specific customization needs. 1. What are the dimensions of the item being inserted into the sleeve (height, width and depth)? 2. What kind if material is the item being inserted made of (metal, glass, paper, wood, plastic, etc)? 3. What is the application of the fulfilled product (once the insert is in the sleeve, what happens to it)? For example, is it hung and left alone, or is it frequently handled? 4. What are the objectives of the sleeve (aesthetic display, protection from elements, water resistance)? 5. What environments will the sleeve be exposed to before and after fulfillment (climate, moisture, temperature, UV light)? 6. What is the stability of the insert size and shape (will it expand/contract with temperature or humidity)? 7. How secure does the insert need to be within the sleeve (immovable within, able to slide in and out with ease, secure enough to remain in place during transportation but easy to remove)? 8. Will the sleeve require a secured or unsecured flap? 9. How long will the insert remain in the sleeve, and is there printing on the insert? 10. What is most important to you? Clarity, consistency, aesthetics, strength or durability? 11. How will the insert material be inserted into the sleeve: automated fulfillment or manual? If automated, what are the requirements of the equipment? 12. What quantity were you looking for?